Happy Monday! I hope you all had a great weekend. I wore this outfit last week and I am just now getting around to posting it. 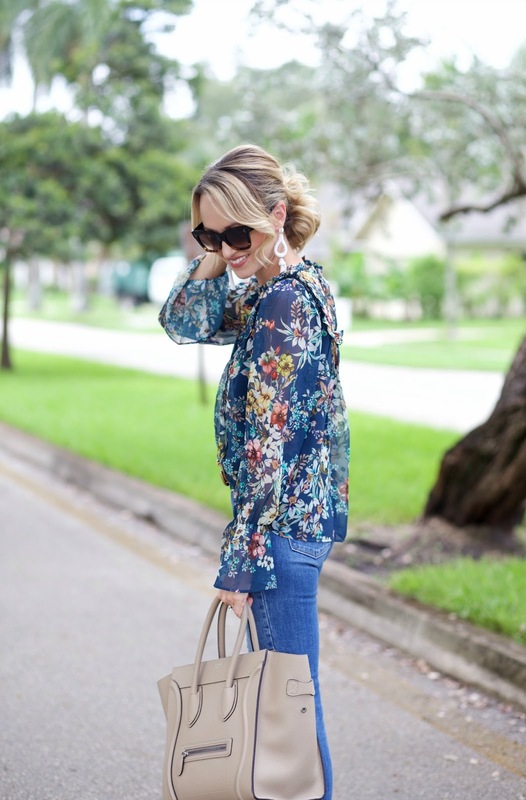 I love this pretty floral top. The colors are perfect for transitioning to Fall. And I love the bell sleeves. Clearly these jeans and these sandals are staples in my closet. I wear them so much. These jeans are high waisted and I love the rips in the knees. And these sandals just go with everything. They are the perfect shoe. Thank you all so much to everyone who entered Friday's giveaway (here). The giveaway is now closed. And the winner of the $100 Nordstrom gift card is Courtney Linden. Courtney I will be emailing you today so we can get in touch and I can get your e card to you. Love this look. So feminine and chic. This outfit is beautiful! I love the pattern of that blouse. Your casual combo is so stylish and girly! Love your belt and blouse! The top is absolutely adorable. Oh my goodness, Thank you Jade! I am so excited!! 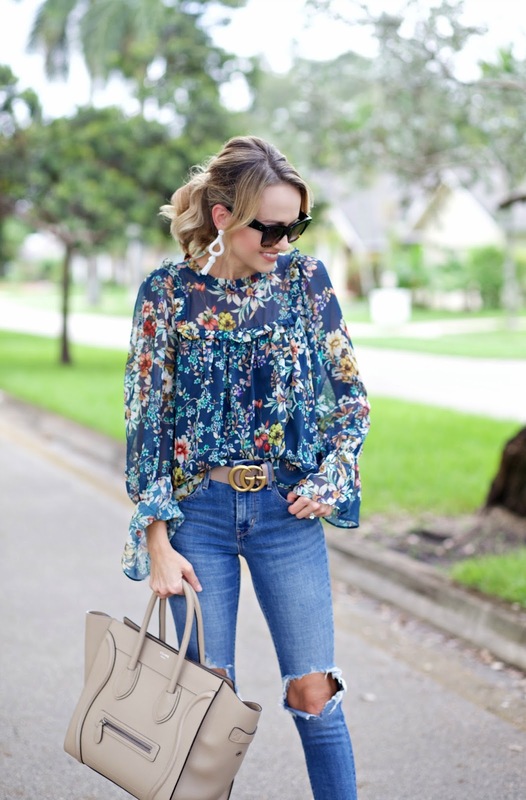 Such a cute outfit and I'm so in love with the print of your blouse! On the one hand the outfit is very elegant - and on the other hand it's casual! I love it ! 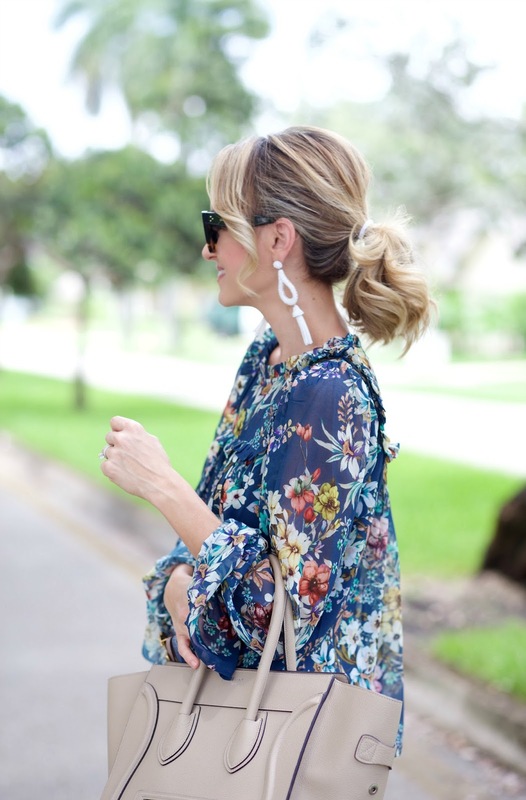 I love the print of this top, it's perfect for transitioning into Fall!